Here’s a selection of behind-the-scenes photos posted on UN social media accounts from the past week and shared with our social media team by members of the Secretary-General’s office who traveled with him this week to China and Europe. While traveling in Europe, Secretary-General Ban Ki-moon met up with a long-time friend, Dr. Dzenana Rezakovic, with whom he travelled to the US some 50 years ago as a student with the VISTA programme. Photo credit EOSG. Good news from Choucha, Tunisia! Rocco Nuri (@rocconuri), who works with The UN Refugee Agency (@refugees), reported that 43 refugees departed last week for resettlement to the U.S. Washington, DC is ready for AIDS 2012 — the first time the International AIDS Conference is back in the United States in over two decades! Photo posted by @UNAIDS. Following the recent outbreak of cholera in Mali, UNICEF is sending 20,000 water, sanitation and hygiene kits to north of the country as part of its emergency response. Approximately 120,000 people, including 60,000 children, will benefit from the supplies that include purification tablets, storage containers and other equipment to Gao and Timbuktu, in the northern regions of Mali, that are currently threatened by cholera. Photo posted by @UNICEFAfrica. Thanks to @AlizeeLx who posted this photo photo of UN Headquarters taken from Long Island City on Instagram. More photos on Instagram from UNHQ taken by UN photographers. This week Ban Ki Moon visited the China’s President Hu. Here’s a behind-the-scenes photo of his arrival at the Great Hall of the People. Follow @UN_Spokesperson on Twitter for more travel photos. Kami, a HIV-positive Muppet, made a special appearance an online talk show about HIV and TB organized by @StopTB and other partners. Photo posted by the UN’s Every Woman Every Child intiatiave (@UNFEWEC) Actor Morgan Freeman took time on Nelson Mandela International Day to help paint an orphanage . Take a look at this Storify compilation showing other volunteer actions taken around the world. The UN Volunteers office in Darfur delivered five wheelchairs, 102 crutches, 75 sticks for blind, tobes and T-shirts this week. More photos available on the AU-UN Mission to Darfur Facebook page. Photo taken by Albert González Farran. While in Croatia, Secretary-General Ban Ki-moon visited the World Heritage Site of Euphrasius Basilica in Porec this week. 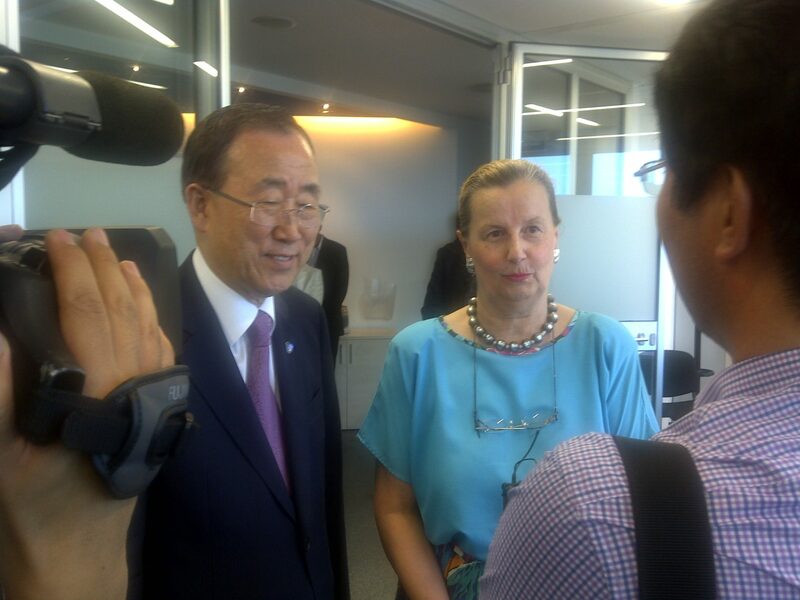 In this photo posted by @UN_Spokesperson, he talks with the media. Peacekeepers from India serving at the UN Mission in Liberia (UNMIL) pose before donating blood this week. Originally posted on the UNMIL Facebook page. The UN Office for the Coordination of Humanitarian Affairs (@UNOCHA) posted this image from Somalia where over 2.5 million people cannot meet their basic needs without help. For more photos, visit OCHA on Facebook. More information in this online story about the Humanitarian Appeals process. 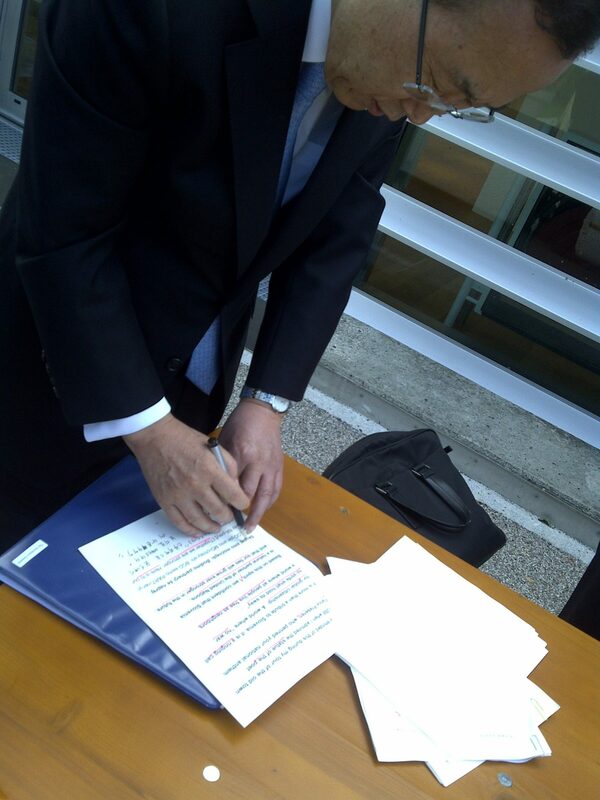 Behind-the-scenes photo of Secretary-General Ban Ki-moon preparing a speech he gave to the Parliament of Slovenia. Find out more in this story from the UN News Centre. Photo credit EOSG. Neo, a bomb sniffing dog working at the UN Office at Geneva poses outside Palais des Nations. Originally posted on the United Nations Photo Facebook page. On an official trip to Senegal, UN Development Programme Administrator Helen Clark (@HelenClarkUNDP) poses with turtles at wildlife reserve in Guembuel near Saint Louis while working on a migratory bird habitat. In addition to the above photo, @HelenClarkUNDP posted this photo of women with fish/shellfish made available through a UNDP project to restore mangroves.